I wake up as the sun comes up with self awareness thoughts bouncing around my mind. I fall asleep again until 8:40 am. I meet up with Renate and Una at the Juice Factory from where we start our adventure into Rumi Wilco. We walk the main trail inside Rumi Wilco to where the earth bag houses are. As we turn back we come to Gulley Trail #4 which goes up the mountain. A moment of hesitation passes before we start the upward trek. We pause often and I am grateful to the vegetation providing us with shade on a hot day. 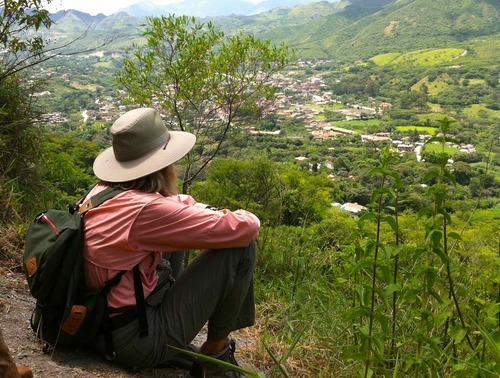 The trail ends close to the top with a wonderful view of Vilcabamba and the river valley. We take pictures and sit for a while at the vantage point. We take a ridge trail back down which exposes us to the sun. We pass a couple of stands of san pedro cacti on the way down. We reconnect to the main trail a short while later. We make our way to the Juice Factory. The fresh orange juice is tart and refreshing. The salad hits the spot. I enjoy a Jerri hug. I take the sim card out of my phone and put it back in. This solves the phone out of service problem. A very loud thunder wakes me up from my nap. A light rain follows. Pat and I pick up Una at Le Rendezvous and continue on to Mr Tomas restaurant. We are the only patrons at first until 2 more couples arrive. Pat is happy with his spagetti dish and I like the shrimp. The Chicken Swarmi that Una orders comes in four hollowed out logs and is quite good according to her. The French Onion soup that both Pat and I order never gets served but is on the bill. We point this out and they are removed. We walk back into the village and I get a ginger carrot piece of pie at Jardin Escondido. It’s my least favourite of all the desserts I’ve tried here. We walk Una home before walking home.